Where did they go??? Here's how to get them back. The m17n input methods package was dropped from the officially supported Ubuntu 10.10 distribution, just as I was getting used to having it around. If you upgrade from 9.10 or 10.04 then m17n should still be in your system, but after a clean install of Ubuntu 10.10 or later you'll need to find and install the m17n package separately. 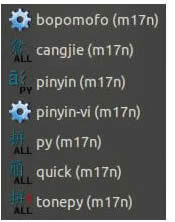 Although many other Chinese IMEs are far more advanced, there are still a few useful keyboards in m17n, including pinyin (m17n), a Pinyin-with-tone-marks IME, and bopomofo (m17n), which offers Zhuyin phonetics only and is not a hanzi character IME. On my Ubuntu 9.10 input methods page I summarized more of the Chinese keyboards included with both IBus-m17n and IBus-Table. You can install m17n from the Ubuntu Software Center, Synaptic Package Manager, or in Terminal using apt-get. Last time I checked it was available as fcitx-m17n, but ibus-m17n wasn't installing and forced me to try the uim-gtk input method framework instead. I may come back to this page to illustrate how each of these can be used to grab m17n, but I'm sure most of you are way ahead of me on this.